A product of Swiss standard in solid quality and innovative looks, Midi is a bus primarily intended for dense urban areas. Its light weight, rather short wheelbase and low flooring enable easy maneuvering and boarding. Pavlov Aeronautika factories were established as part of the Pavlov enterprises in the mid-1910s. Ivan Pavlov, a pioneer in rotorcraft design, himself piloted the P-42 on its maiden flight. Originally designed for anti-submarine warfare use, it soon became immensely popular in air taxi business as well. 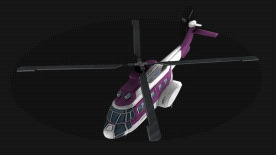 A robust helicopter with relatively low empty weight and slow acceleration, it is especially suited to cover mid-distance passenger and goods transportation needs. The Stingray Cityjet is a fast short-distance catamaran of Australian origin. Recently announced third generation of these vessels have high fuel efficiency and notably low noise emission. These vessels are aimed for regular ferry service and sightseeing use, featuring comfortable seating and a service deck. Italian-built Vagabondo trams first saw use in Rome during the upgrading of the municipal rail network. The Satellite is a very reliable, although not the most visually appealing, single-body six-axle tram with a partial low-floor configuration. It has driving cabins on both ends of the frame.